A wonderfully conceived blend of atmospheric elements and haunting melodies artfully woven into engaging portraits. This album oozes with a personal, intimate sound that is at once ethereal yet memorable, evincing a captivating purity in its emotions. 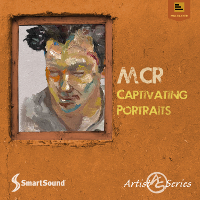 A strikingly different second album for Artist Series composer, Michael Reinmuller, all of SmartSound's great technological benefits are present in this album giving you maximum control in making these highly personal pieces unique to your stories.